AskNadia: Why is My Blood Sugar High When Nothing Has Changed? I was diagnosed a type 2 diabetic 14 years ago this month. For the most part, my daily fasting numbers averaged 107 while taking three oral medications (2k Metformin, 3 mg Glimepiride, 50 mg Januvia). Recently (maybe three weeks) my daily average has hovered around 148. Any ideas? Nothing has changed in my diet or activities. There are many reasons why people can suddenly experience higher blood sugars. Sometimes people with diabetes have said that their higher blood sugars are a precursor to being sick. Good and bad stress can also raise your blood sugar. I have also read that over time people with type 2 diabetes may experience higher blood sugars, deeming their current prescription to be less effective, requiring their medications to be increased to achieve the targeted blood sugar range. When you start feeling sick, your body’s immune system will fight the infection by releasing hormones and glucose. If you treat your illness with over-the-counter cold and flu medications, you need to be aware that some medications may have sugar in the ingredients. Make sure to read the labels first. Medications that numb your throat may also contain sugar. There is no question that the American lifestyle is more stressful than most other countries’. We have less time off, work longer, and get paid less. The American dream of a one-income family is not realistic for most. We are juggling a plethora of administrative things that we need to take care of on a daily basis, such as keeping a schedule, going to work, buying groceries, paying bills, raising children, taking care of animals, family parties, and the list goes on. I do not know about you, but I feel stressed just reading my list. Add diabetes self-management to all your daily tasks and the stress tower may start looming behind you. We also experience good stress. Being excited about an event or completing something that was a goal can also raise your blood sugar. What happens when the adrenaline and cortisol hormones are released? It raises your blood sugar and blood pressure. Nothing is more frustrating than waking up in the morning, checking, and seeing a high blood sugar level. You took your medication and had not eaten through the night, so what happened? The human body releases extra glucose in the early morning just before waking up. Called the “dawn phenomenon,” the increased glucose production provides energy for getting up and facing the day. In people who do not have diabetes, the rise in blood glucose levels is easily controlled by the release of insulin. In type 1s and type 2s, the increase in glucose levels is not controlled by a release of insulin because either your pancreas does not make insulin or you are insulin resistant. Sometimes when you think you are eating well, you are consuming some form of sugar, which can be an ingredient in any dish you order. We do not usually think to ask if sugar is in our entree. If you check your blood sugar and it is higher than expected, then it may be a hidden or unknown ingredient that is the culprit. Checking your blood sugar gives you feedback so you can make the adjustment you need to make to deal with a post-meal high blood sugar reading. To isolate the reason why your blood sugars are higher than normal, call your healthcare professional that prescribed your medication and share your food log, time medication was taken and your activity log. This will help them isolate what might be occurring allowing them to recommend a newer therapy that will help you reach your targeted goal. Wishing you the best in health! 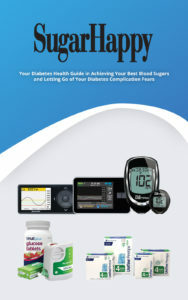 If you would like to order my new book “Sugar Happy- Your Diabetes Health Guide in Achieving Your Best Blood Sugars and Letting Go of Your Diabetes Complication Fears” launched on April 6th and pre-orders ranked #7 on the Kindle top 100 new releases. This book is for people living with Type 1 Type 2 diabetes, family members that want to learn more about diabetes and people that have pre-diabetes to better understand how they will need to manage a diabetes diagnosis. It is meant to be used as a guide, allowing you to look up topics of interest. For a limited time before the June 3rd release, I am offering the Kindle version for 99 cents. AskNadia (ranked #1 by Google), named “Best Diabetes Blog for 2017 by Healthline and one of the top 50 diabetes influencer’s blog that is a must follow, and with 23 nominations, Nadia Al-Samarrie’s efforts have made her stand out as a pioneer and leading patient advocate in the diabetes community. Nadia was not only born into a family with diabetes but also married into one. She was propelled at a young age into “caretaker mode,” and with her knowledge of the scarcity of resources, support, and understanding for people with diabetes, co-founded Diabetes Interview, now Diabetes Health magazine.